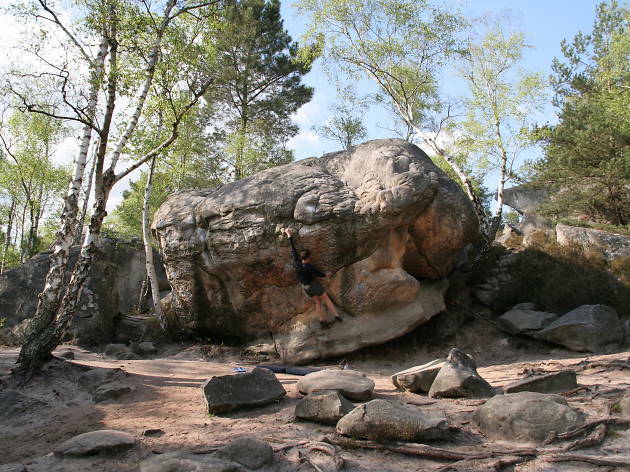 The ancient boulders at Fontainebleau are world-famous and on every serious climber's bucket list. Lucky for you, they're just a train ride away. 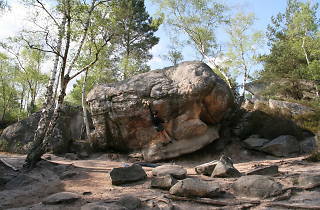 The forests at Fontainebleau (which surround the manificent Château de Fontainebleau)are famous for their massive, prehistoric boulders; French alpine climbers have been coming here to train since the early 19th century. More recently, the area has become a prime location for 'bouldering' — in fact, the largest and most developed site in the world. With marked routes and a 6-tier grading system (with colour coding) for difficulty, it's ideal for beginners and pros. Idividual boulders are even marked with arrows to indicate the direction of the climb. For the uninitiated, 'bouldering' is a form of low-altitude rock-climbing, usually done on boulders or small rock formations, without ropes, harnesses or other equipment (save a foam mat or 'crash pad' to soften falls). Extremely physically demanding, it is also a very cerebral sport: a puzzle for the body, forcing a climber to work out holds and perches on their own. It is an ideal introduction for amateur climbers or beginners, allowing them to develop their technique (as well as their muscles and calluses) at relatively low risk and without having to buy or rent any expensive equipment. Outdoorsy Parisians come by bike from the local train station to spend the day in the forest, hiking, climbing and picnicking among the boulders. To get to Bleau, take the RER D from Gare de Lyon and the woods are a 15-minute bike ride away.